CONTAINA – PACK supplies wheelie bins in seven different stock colours and two sizes. 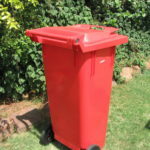 Wheelie bins make ideal storage containers and are used for storing all types of “stuff “ from animal feed to raw material and of course refuse. In industry the wheelie bins are used for controlled housekeeping. The wheelie bins we supply are manufactured according to stringent quality control and have a guaranteed long service life. The 240 litre wheely bin is SABS certified. These wheelie bins have a high resistance to UV and chemicals. They have large rubber tyres which make them easy to handle and the rounded internal corners make cleaning the wheelie bins very easy. 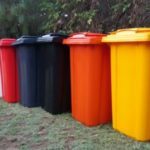 Three or four wheelie bins can be used to make a recycling station.The bins have interchangeable lids so charcoal bins each with a different colour lid, for easy identification, can be used. The two most popular size wheelie bins are the 240 litre and the 130 litre. The 240 litre is the size used by most municipalities and is SABS certified. The 130 litre wheelie bin is ideal for smaller households and makes an ideal bin for recyclables.